players of the dharma initiative alternate reality game, meant to lead-in to season 5, got a strange email recently, saying that the financial crisis had 'shut down' the dharma initiative. it was hard to tell if this is supposed to be part of the game, or if something had indeed happened. well, now all is clear. damon and carlton confirm that the ARG for season 5 has been scrapped due to budgetary concerns. frankly, i'm more interested in what they'll be providing anyway: behind the scenes teasers for the upcoming season. the ARG's always annoyed me anyway. while a nice distraction, aside from the 'missing pieces,' they were not considered canon, and were not written by, or developed by the show's producers. 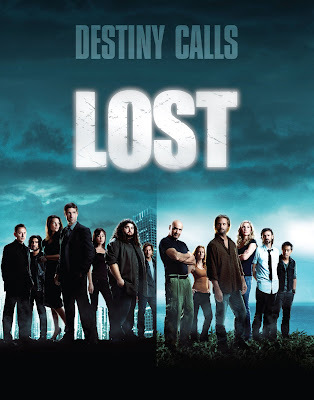 each season of lost is a complete story unto itself. like the harry potter books, each provides a piece of the larger picture, but also contains a central theme. i love how each season's dvd box set of 'lost' has a different color scheme and look. and now this. at first i thought it was a piece of fan art, but after checking abc.com, i've got to make my disappointment official. wtf!? this is exactly the same color and style as the season 4 poster! not only that, the season 4 poster contained all kinds of tantalizing clues about what we could expect from the show. this poster offers nothing more than confirmation that daniel farraday is not dead, charlotte and desmond are joining us from the cast of 'little people big world,' and claire, as reported, will not be joining us. my hope is that this is only a teaser, as the official season 4 poster was not released until a month before the premiere. here's a great article profiling a q&a damon and carlton did for the 2008 screenwriting expo. overall mythological structure was not determined (or even really thought about) until the show was given a full season order beyond the original 12 episode deal. michael emerson was cast to play ben for a 3 episode stint, which also served as his audition for the character to be the leader of the others. "this year will probably be a little bit more science fictiony." mr. eko's botched storyline was the result of adewale akinnuoye-agbaje absolutely hating hawaii, and wanting to leave by the time they'd shot his second episode. "originally he was going to be someone who challenged Locke for the spiritual leadership of the castaways." such a shame. that could have been soooo good. possibly joking about their 'favorite scene from the series finale,' they said: 'it involves a volcano.' tantalizing, as the island's volcano has been mentioned a couple times.